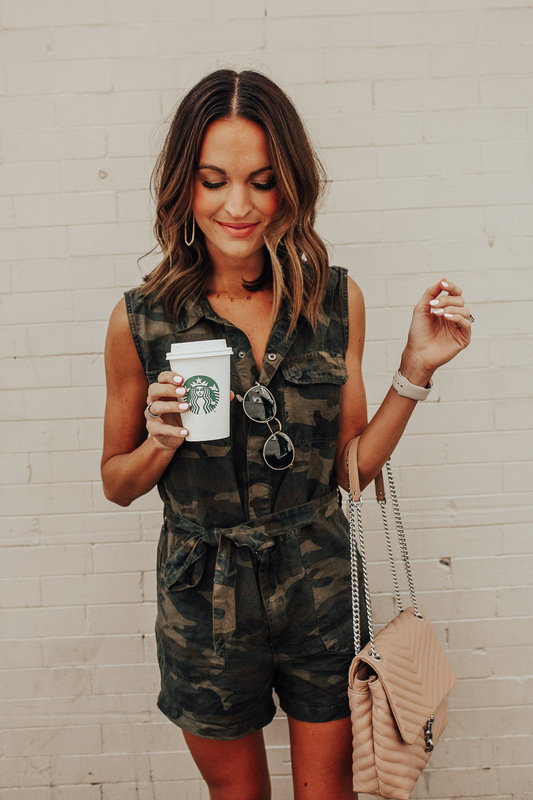 camo & coffee: my go-to healthy starbucks drinks! [Cold drink]: Coffee frappuccino light (and then I put a dash of cinnamon on top). This is basically just like blended coffee with nonfat milk in it…and then I add the cinnamon on top for a little bit of sweetness! This is one of my go-to summer drinks! Light and refreshing with a nice kick of caffeine. [It’s really yummy with an extra shot of espresso too]. [Cold drink]: I don’t even know what to call this drink but I’ll tell you how to order it lol. Grande iced coffee (or cold brew!) + 1 pump sugar free vanilla + 1 pump of toffee nut + light cream. This is my most recent healthy starbucks ‘invention’ lol and it is SO GOOD!!! Several of you guys have tried it recently and tagged me in stories and I LOVE seeing that! I have a few other healthy starbucks drinks I like, but they aren’t necessarily coffee-based. I’ve experimented a lot with passion tea options…but I don’t love anything as much as the above 3 coffee options! If I find some tea options I love, I’ll let you know. But I’m definitely a coffee girl through and through haha. 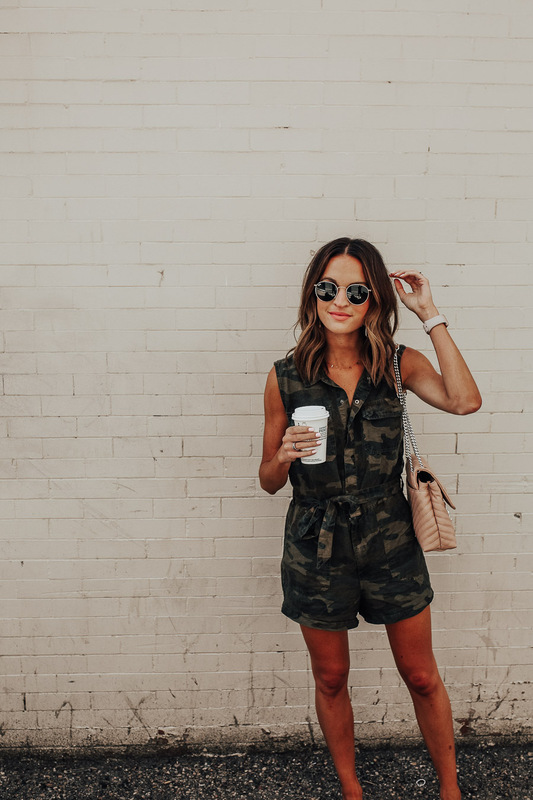 I also wanted to talk about this camo trend for spring that I’m loving! 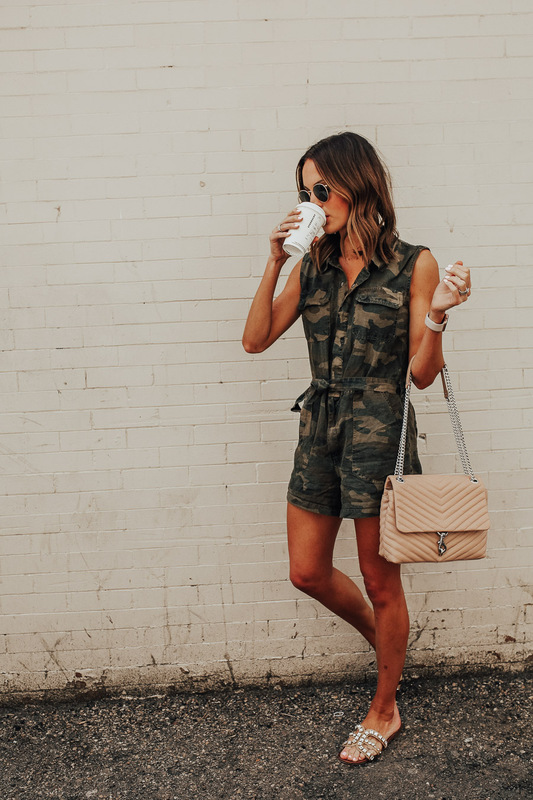 If you’ve been following me for a while, you know how much I love camo, year round. I feel like this is one of the first times though I’ve ever seen it really trend for spring! 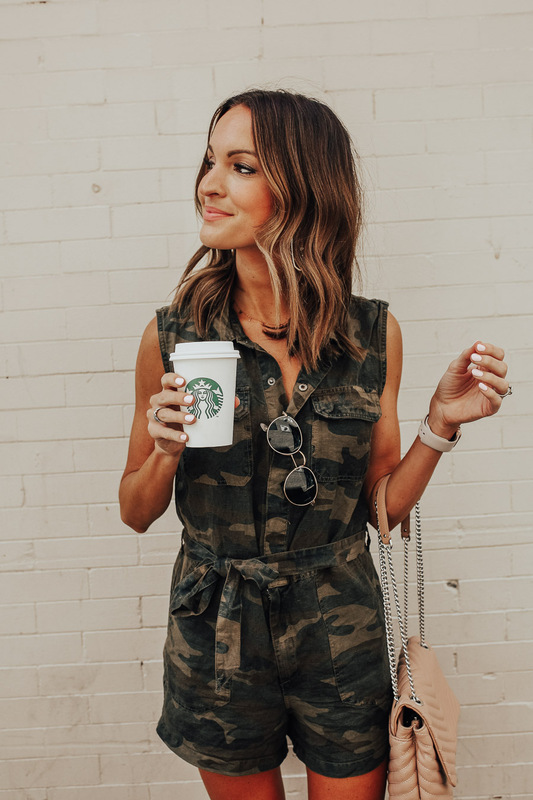 I am in LOVE with this belted romper – it comes in this awesome camo print but also a cute tan color too! I love rompers like this for summer because they are so easy to throw on with slide sandals for running around town and getting stuff done. But it’s also a piece you could pair with wedges for a dressier night out! Do you have a go-to healthy starbucks order?! Share in the comments below so we can all try out your concoction! 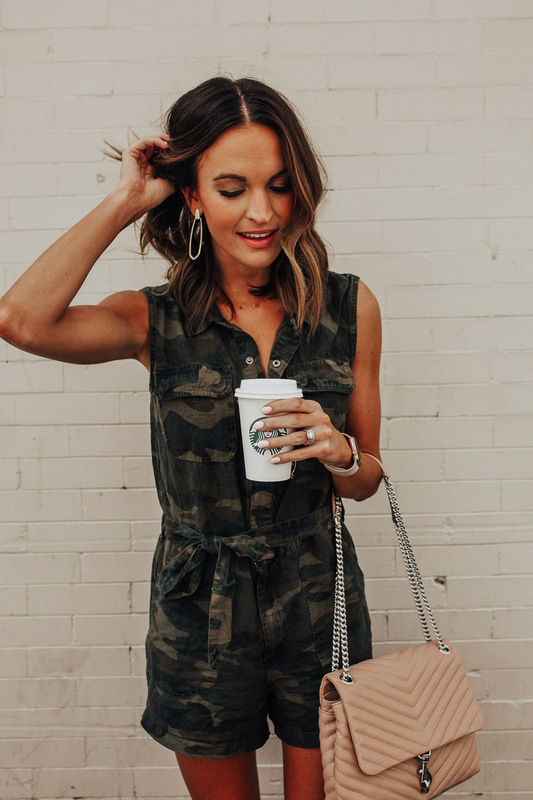 I mean – camo and coffee…doesn’t get much better right?! My go-to healthy Starbucks drink is a grande iced coffee with coconut milk and 1-2 pumps of sugar free vanilla! It sits at around 80 calories total but is so delicious and wakes you up! yess love me some cinnamon dolce! Those drinks sound really good. I’m a huge Starbucks fan and I like to get a latte or an Americano. I agree your drinks are low-cal (which I like to opt for because I don’t think a 300, 400, 500+ calorie drink is healthy) but I also don’t think sugar-free syrup – which contains artificial sugar – constitutes a healthy option either. yeah I know some people don’t like sugar-free syrup, but I’m personally okay with having it in moderation! thanks for reading! ooh that sounds perfect for summer! definitely need to try that! I get headaches from all coffee but still need caffeine! I also can’t tolerate the sugar free syrups. So I get a venti hot rev up wellness (which is a mix of green and black – much less bitter than straight up green), with an extra large splash of coconut milk, then one or two honey packets, which you have to ask the barista to add for you. It’s a great caffeinated, fairly healthy tea drink! oh that sounds so good too! thanks for sharing! yes definitely give it a try! hope you love it! Fan of this but with coconut milk. Yessss. Yummm. 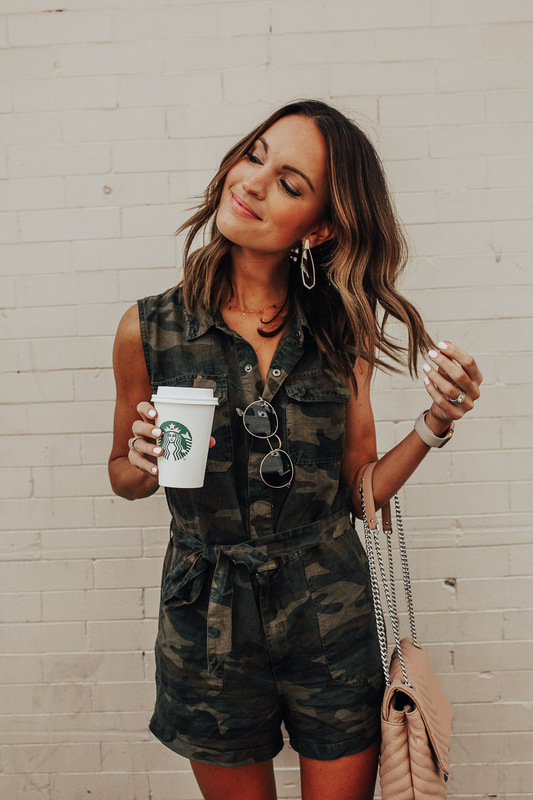 Love the romper! Drinks with artificial flavors,…that can’t healthy for our body. hi heather! totally understand everyone has their own opinion when it comes to what they deem ‘healthy’. I find a LOT of the drinks on the starbucks menu to be super high calorie and full of tons of sugar, so these are what I order as healthier alternatives. thanks for your input though!